FP: You have been in decent form, winning the Nationals and then reaching the semis of the Indian Open. What did you do different? Sharath: Actually nothing much. It's just perseverance. I have continued to work in the same way in the last seven-eight years and now I am reaping the benefits of it. One thing that has changed majorly is that I have been working more on my physical fitness because, as many people say, I am a veteran in this sport, and so I have to catch up with the younger players. For that, I need to be physically fit. Apart from that, of course, I am mentally better (prepared) than them because I have been in the business for a longer time and I know the tricks of the trade. So I have been working quite a lot on the physical part which has been helping me to perform well. FP: How has your game changed over the years? Sharath: There has been a lot of change. The sport of table tennis itself has had a lot of change. There were faster bats earlier and the balls were faster. They have made everything slower now. Earlier there used to be only forehand players. Now you need to play both forehand and backhand. It has been like that in tennis also. Earlier tennis also used to be the same. So physically, it has become much more demanding to keep up with all this. I have to be updated with the new techniques and keep my game in line with the new age. I have to work on a lot of aspects which I didn't work on in the earlier years. I think, especially, between 2010 to 2012, I had a big transition problem to get updated with the new system. There I took a little bit of time, but when I got updated, things got a bit better. And I have been starting to perform again. FP: You play an aggressive brand of table tennis. Has your aggression toned down a bit over the years or is it the same or have you become more aggressive? Sharath: Of course. Earlier when I was young, I used to have long hair and everything. The hair is receding (and) the same way aggression also recedes (laughs). So yes, the body can't be the same way... but the aggression in the mind hasn't receded. That way I have kept myself quite active. Because that's my game, I don't know the other way around – to be calm and passive. Sharath: Yes. Back in 2010-11, the game was changing and you could not be playing forehand all over the table, moving from left to right only with the forehand. So the backhand's importance was developing. And I had to work on it because I didn't know that the backhand was an important part (of the game). But from 2010 onwards, I started to work on it, trying to develop it, though it's still my weaker side. The difference in balance between the forehand and backhand is quite big. But at least now, I am trying to get a better backhand and move with a well-balanced game. I think that is what is taking the opponents by surprise because the forehand is as good as before but the backhand is improving and that is where I have been getting better. FP: What did you do to get the backhand stronger? Sharath: It basically boils down to the hours of practice you put in. So what you put in is what you get out. But I put it in with a right direction. I still have a personal coach. He is Linus Mernsten from Sweden. He was the one who said, "No, you need to stand there in the backhand corner and play a backhand." So I worked a lot on the technique. My backhand technique was bad, so I had to undo and redo everything, starting from scratch. And in that process my forehand got weaker because when you try and work on your weaker side, your stronger side gets hit. And also the connections between every stroke, the balance and everything else go haywire because you are changing something at the basic level. So it took me a lot of time, but I am happy that I did the change and that is the reason I have been able to sustain and grow for such a long period of time. FP: Was that the reason you faced a period of lull from 2010 onwards? FP: How much of analysis goes into reading the opponent? How much do you analyse your opponent? Sharath: Very much... very much. 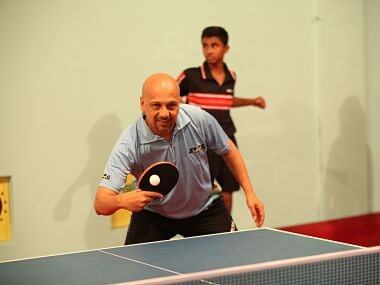 Because table tennis by itself is a very technical sport and there is a lot of spin and speed involved. We need to see, for some people, which kind of spin they are not good against or (for others) which other kind of spin they are not good against. So you need to be able to read what exactly the opponent doesn't like to do or what he likes to do and try to give them the opposite. So there is a lot of analysis going on during the preparation and during tournaments. There is more analysis going on during the preparation of a tournament because you have the list of players against whom you are going to play and you need to analyse yourself too because you are also being analysed by the other players. A lot of homework goes into it. FP: Do you comprehensively analyse every opponent? Sharath: Analysing every opponent is very difficult because there are a lot of players. So we do analyse the most likely opponents, say 30-40 players. The video analyst is my brother – Rajat Kamal – who was the video analyst of the Indian table tennis team also. I give him the videos and he breaks down the data. That way it makes my job easier because if I have to sit down and work on the analysis, then I would be spending a lot of energy and time. So my brother does it. He gives me the data and I internalise it. The remaining players who I don't analyse would have been analysed by someone else in some other part of the world. So I try to get the contacts. Some coach would be analysing the other players, and so I ask him, "Okay, do you know anything about him?" However, only the Europeans are ready to share (information) with you. The Asians don't give you anything. It's like give and take, they help me this time, I will help them some other time. It helps the sport develop. FP: How much of a mental aspect it involved in table tennis? Sharath: Very much, very much. I think in any top level sport, there is a lot of mental conditioning (involved), and a mental game goes on between two players. Because every time, you need to read what the opponent would do, what he is likely to do, what I can do as a counter and what he will do in reply to my counter. There is a lot of mental game going on. It's not just a physically competitive game. That is the thing with racquet sports. Every time the ball is involved (and) every time you need to beat the opponent mentally first. And (when you do that), half the war is won. A lot of times, it's the mental fitness that puts us down. So there you need to be fit. Many times you don't take care of it because you are working on the physical part. But the mental part is also very, very important. FP: Do you change your mental strategies according to a specific player? Sharath: Yes, yes very much. Because everybody is different. Everyone has their strengths and weaknesses. So I cannot have the same strategy. I might have some strategies which are the same but those will be my strategies. What I want to do with my game (is that) I need to play my forehand, I need to go hard on my forehand, which is my game. This goes on with everybody else. But it will change according to players on how I build up to get to that forehand or where exactly do I want to place the ball. So those kind of things are always variable. FP: In one of the interviews you had said, playing table tennis for long hours gets you bored. How do you keep yourself motivated? Sharath: Play as less as possible (laughs). It's all about the quality. Now I have come to a stage (where) quantity is boring. Quantity of anything. If I do too much of physical exercise, it's boring. So everything has to be measured. The time I am there, I have to be really geared up. When I know that okay, today is going to be a two-hour session, then I am looking forward for the two-hour session. If I know that I need to play two hours in the morning and two hours in the evening then many times the two hours in the morning is okay, it's 80 percent but then the evening session is only 50-60 percent. So instead, I prefer one two-hour of 100 percent or 110 percent. FP: What's your approach when an opponent suddenly starts playing opposite to his strengths? Sharath: Well, it does happen sometimes. You get startled. And it depends on how long you are startled. It can take you a match or it can take you just one set or it can take two sets, three sets. It depends on how fast you can get yourself composed and get back into the groove. Of course, people do that. I myself have done that with many players and have won a lot of matches like that. But it all depends on how fast you are able to read it and how fast you are able to adapt to it. So it's all about the mental fitness again. How aware you are of what is happening. FP: Do you have memories of anything of that sort happening? 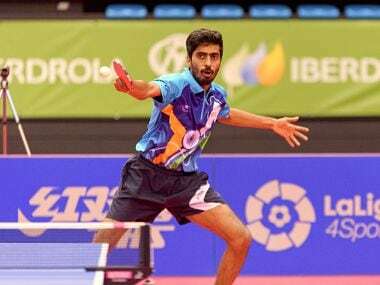 Sharath: In the National Championship final, I played Soumyajit Ghosh. Normally his backhand is stronger than mine; that is where he takes me down. But I started to challenge him with my backhand. He didn't know where to play and I won the match. By the time he could realise what he could do more, I was just giving more and more pressure. Even though the backhand wasn't my strongest point, I still believed that this was the only way I could beat him because the other way around, he would beat me. His probability of beating me was more. So this was my only chance and that was what I took. FP: What goes through your mind when you have just lost a point? Sharath: It depends. There are so many emotions, there are so many thoughts that go through your mind during a match. It depends on when you have lost the point. What happened before. What happened after. But the best thing would be if you are in the zone. No thoughts. You lose a point, you win a point, you are there playing the next point. But it's not so easy to get into the zone every time you play. Even though you train, and do whatever you want, you need to hit the zone exactly at the important points. And it's not so easy. I try not to be negative, at least from my body language so that the opponent doesn't get too easily confident. That is what I try but that doesn't come off every time (smiles). Sharath: (Interrupts): Frustrated. I would be quite frustrated. I would be quite angry but at the same time, we need to continue. We need to go on. The match is not over until it is over. So you need to continue. FP: Does that affect the other points that you play? Sharath: It could. In the next point, directly it could affect. FP: If the opponent has taken a sizeable lead, what is your approach? Try and play safe or take the risky route and be ultra-aggressive? Sharath: All this is variable because each match is different. Each opponent is different. Probably with somebody I need to play safe, probably with somebody (else) I need to raise the risk level. Probably with somebody I need to play faster. Probably with somebody (else) I need to play slower. It all depends on what is happening during the match. But the most important thing is to never give up. 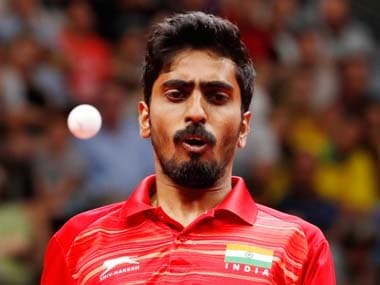 Even if it's the second or third set, even if you say this set doesn't matter, you always try to get the points and show the opponent, "Okay boss, I am here, I haven't gone anywhere, I am here." FP: How much of your height gives you an advantage? Sharath: It's both ways. Because being tall near the table, I need to bend a lot. And I feel cramped. Claustrophobic. So I need to always take a distance. I need to take space, but at the same time, the ball doesn't go out of my reach as I am tall and the table is small. So it's both of an advantage and disadvantage. FP: Do you experiment with the blades and rubbers? Sharath: We do. We do have to constantly keep experimenting. This is also an important part of updating yourself. Sometimes you need faster blades, sometimes slower, but faster rubbers. So you need to keep trying, but at the same time, you also need to keep your original stuff. It does take a lot of time and effort, but then it is necessary for the sport. FP: Amidst all this, don't you get mentally exhausted? Sharath: We do get mentally exhausted, especially after playing the sport for such a long time. But that's exactly what I said – quality is what keeps us going. So if we have a good plan and we are sticking to it and we know that this is what we are doing, with a clear goal and clear aim, then even though you are tired at that time, you know when to vent it, when to relax, when to come back and how to keep it going. FP: Do you analyse the opponents' equipment too? Sharath: We try to. But at the same time, many times others' equipment don't suit you. Because of technique and the way you play. So you need to get down and try. We could share with other players, "Okay, this is how I feel about this rubber," but until and unless you play (with) it, you don't know what the rubber can do or the blade can do for you. So the analysis there is very individualistic. There are some players playing with different kinds of racquets. Odd rubbers. Defensive players play with other rackets. So with them, you need to know what kind of rubbers they are using so that you know how the ball can react. 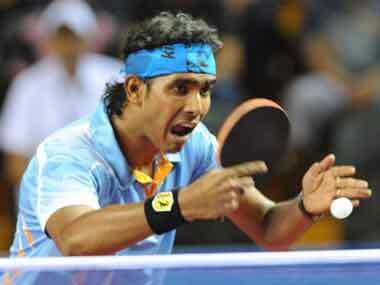 But generally, in men's table tennis, 80 percent of the players play with normal rubbers. FP: How do you find out the information about opponent's rubbers? Sharath: At our level, we see the players in all the tournaments. So it's constant visualisation or updation with the other players or coaches. FP: Table tennis is a very fast game. Do you get time to analyse within a match? Sharath: No we don't. Many times, you come out of the match and feel, "Why didn't I do this?" Many times, because it's too fast. We do have a break, the coach is telling you stuff but still, there are times you feel that "I should have done this." FP: When the coach gives you instructions, how much of the information do you go on to implement? Sharath: You need to try to do it 100 percent if you trust the coach. It's always better to have someone in that corner who you trust than someone you don't and then you play along. FP: What is your go-to shot? Sharath: When the ball is half high, close to the net, I hit it inside out.